Across Eastern Europe, drug use by injection is fueling the world's fastest-growing HIV epidemic. Until recently, Romania had been spared, in large part because of NGOs that distribute clean syringes. But as the recession bites, health budgets shrink and international investment slows, activists worry that their clean-needle programs will be shut. 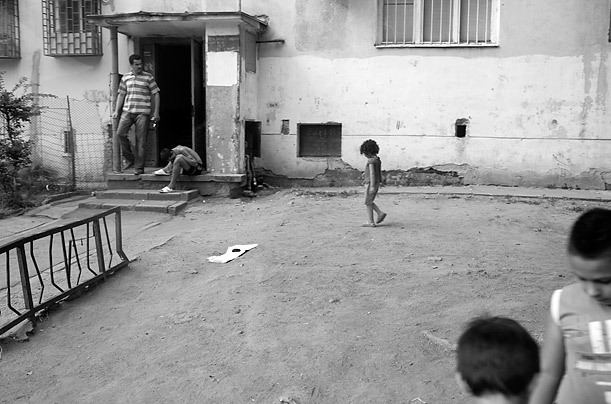 In this photo, a man shoots heroin in front of children in Ferentari, an impoverished Roma slum. Such sights are common, and many children in the area come to see drugs as a part of daily life. Costin Militaru, an outreach worker with Integration, an NGO that campaigns for addicts' rights, has met addicts as young as 9 years old. "His family had no money for food. He was hungry and kept crying, so they fed him heroin," Militaru says. "If you're high, you don't need food."